Four Square 5.0 for ios & Android!!!! Four Square a top rated app available on ios & Android has been redesigned. A location based app available for smart phones has been redesigned in such a way that makes it “a whole new app”. Redesigned app incorporate features from Social Discovery app like ambient social & various local search apps. *Bigger boxes for photo swiping with explore option. *Three tabs are included- “Explore”, “Me” & “Friends”. Friends: This tab allow you to check locations where your friends have visited & there updates. It also allows you to add comments quickly. Explore: It allows user to explore category. Better search option than Google & Yahoo. It shows personalized set of search results based on check-ins & location popularity according toFour Square. Me or User Profile: It now shoes mugshot, setting bar & bio. Six boxes are also added Friends, Stats, Photos, Tips, Badges & lists that provide better user interface. *Top picks are also added that provide you the option to search terms without search option. *Facebook users can now share check-ins in Facebook timeline. 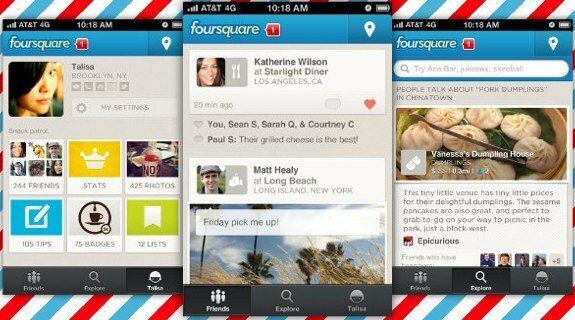 Four Square promised that its redesigned version for Blackberry will be releasing soon & they are working with Microsoft for Windows Phone. You can download FourSquare from Google Play store & Itunes here!!! !